In 1882, the Russell School District was formally established in what would later become the Town of Russell. The ground floor of the Town Hall was used for classes until a new school building was constructed in 1884, at a cost of $892, opening in early 1885. An addition was made to it in the fall of 1894 but the limitations of the building became increasingly evident so, in the fall of 1897, a two-storey building was constructed on the present site of the Russell post office, and the old school was renovated into residences. A two-storey addition to this building was made in the fall of 1899. A high school was started in 1909 so, to provide the requisite space, a two-storey building was purchased from the Smellie brothers and moved to the school property. By 1913, this space was insufficient so the School Board authorized the construction of a new building designed by Winnipeg architect William Bruce. It was occupied in the spring of 1914 by a staff of seven teachers. By 1966, there were three school buildings operating in Russell, with a total student enrollment of about 600. They were combined under the umbrella of the Russell Consolidated School No. 2454 but quickly became part of the Pelly Trail School Division, later that year. Among the teachers who worked at Russell School were Margaret Fulton (1943-1945) and W. J. Sharman. 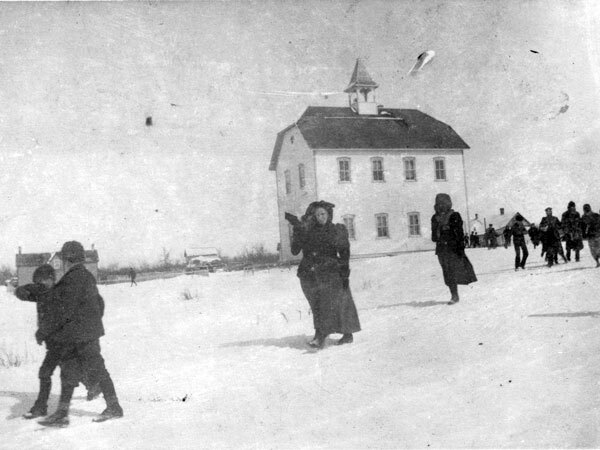 Source: Archives of Manitoba, Russell Schools 1. Banner County: History of Russell and District, 1879-1967 by the Russell Women’s Institute.